We are a leading business organization engaged in processing a wide variety of Dental Care Medicines. The medicines we offer to the clients include Potassium Nitrate Toothpaste, Chlorhexidine Gluconate Mouth Wash, Analgesic Gel For Mouth Ulcer and Astringent Gum Paint. This range is precisely formulated using pure ingredients and is made available in different variants. Before delivering these products to the clients' end, we test these on various aspects like effectiveness. Clients can avail from us a range of Potassium Nitrate Toothpaste, which is formulated at our end using high-grade ingredients. We make use of advanced techniques and other amenities while processing these products, so as to ensure that these are safe for usage and do not harm teeth of the users. Pack: 50 gm Laminated Tube. 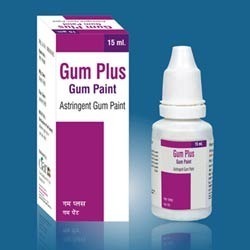 We bring forth a wide range of Astringent Gum Paint, which is made available for the clients at competitive prices. Our products are processed using premium-grade ingredients and advanced techniques, thus ensuring their compliance with international industry standards. In order to ensure their high efficacy, we process these from pure ingredients that are sourced from trusted vendors of the market. 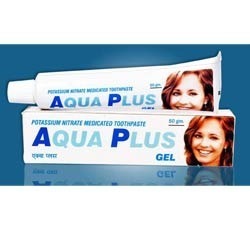 Looking for Dental Care Medicines ?